That David Oistrakh was one of the greatest violinists of the 20th Century is unquestionable, a man whose artistry displayed a deeply serious poetic insight which ranged far beyond mere virtuosity, eschewing display for its own sake. Nevertheless, I had some worries before listening to this CD. 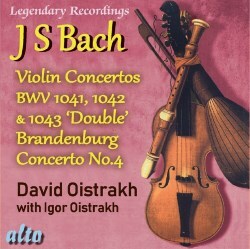 I first heard Oistrakh’s DGG recordings half a century ago, when I first began my exploration of Bach. I recalled very well the delight they gave me, most immediately in the BWV 1060 reconstruction of the two harpsichord Concerto for violin and oboe, a recording - alas - missing from this reissue. I had not listened to my old LP for decades, and so I approached this disc with the same trepidation that comes over me when I see again a much-loved film from my distant youth, that it would seem hammy and wooden. The fear was greater because of the enormous developments in period practice, notably in Bach, since my youth. But of course, even in the 1950s, there was a growing awareness that nineteenth century practices in playing Bach were inadequate. In April 1955, The Gramophone gave a blistering review of Klemperer’s first Columbia set of the Bach Orchestral Suites, pointing out that: ‘The conductor or leader of an ensemble has to read between the lines … to bring out the real intention of the composer’, before going on to characterise the performances as ‘heavy, lumpy, turgid movement where there should be nothing but light, air, and noble graciousness’. Fears were not absolutely groundless, notably in the orchestral accompaniment, which sometimes – despite some admirable playing – was sometimes a little ponderous, and without full attention to decoration. Phrasing might have been sharper for modern taste, and performances were a little slower than we might expect from some modern period ensembles (though I sometimes wonder whether instrumental practice was sufficiently advanced for eighteenth century players to manage quite the breakneck speeds sometimes heard today). But Oistrakh had an acute artistry – his playing was never languorous or self-indulgent, and great artistry, sensitive phrasing demonstrate insight after insight in each of the performances here. Despite the antiquity of some of the original recordings, with the Brandenburg Concerto, from Melodiya, coming from 1957, the sound has been preserved very well. The original DGG recordings were models of their time, bringing out so much detail, and the Melodiya, while not in the same class, with a restricted and rather recessed orchestral sound, has been remastered to ensure little distraction.